Ride your jet bike around several courses and try to beat the other three riders to cross the line first. Three sets of courses (lakes, docklands and coastlines) are on offer, and you can select standard and expert levels. Standard level requires you to complete the course within a certain time; it doesn't matter if you come last. However, if you fail to beat any of the other three players on expert level, you're out. The graphics are beautiful and there's some nice music and digitised speech. I think the expert mode is far too hard, though. See also: Championship Jet Ski Simulator. 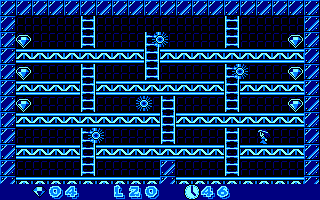 Jack likes listening to groovy music, and in this platform game, he has to collect all the musical notes on each level, while avoiding all the hazards – and there are many of those. There is a total of ten levels, and you must manoeuvre Jack around each screen, being careful to get on and off the lifts and moving platforms at the correct moment. You'll also have to watch your head; there are stalactites and monsters protruding from the ceilings, and if you touch them, you'll lose a life. There is also an energy bar which needs to be replenished frequently. This is a fast-paced game which is marred by being very difficult indeed. There are so many obstacles on each screen, and you rarely have time to think! It's a shame, because the game would otherwise be fun to play. 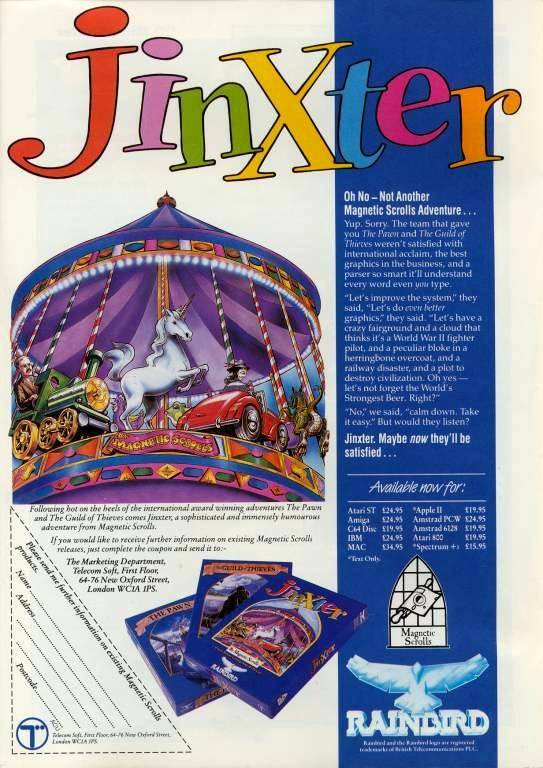 When this game was originally released for the ZX Spectrum in 1983, players were gobsmacked; it set a new standard for arcade games on the humble Spectrum. 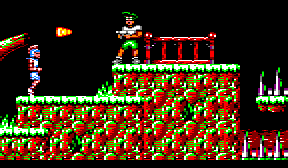 This is an emulated version of the game which uses the code from the Spectrum version, and it's lost little of its quality. 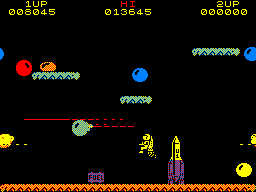 You are a space pilot who has to assemble rockets and collect fuel for the rocket in order to escape from each level, while simultaneously dodging aliens and shooting them with your laser. The graphics are basic (although stippling is used to give the impression of more colours) and the sound effects are mediocre by the CPC's standards, but once you start playing this game, it's difficult to pull yourself away from it. The concept is really simple but it's very fast-paced indeed and there is a real urge to have one more go. 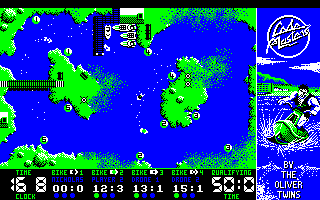 The sequel to the classic Manic Miner, Jet Set Willy is another of those strange games where you jump around impossibly difficult screens and avoid weirdly abstract bad guys. The story behind this one is that, having just bought a mansion and had a huge house-warming party, his housekeeper won't let him into his bedroom until he gathers all the trinkets from around the mansion's grounds that his guests have scattered about. So instead of firing her on the spot, Willy sets out to do just that. The graphics are colourful and actually quite good in a simplistic way, and there are a few nice sound effects, but don't even think about finishing this game! Despite being supplied with an unholy amount of lives, this game sets new standards in difficulty! The mansion is too huge, the monsters are too plentiful, and it doesn't even tell you how many items are left to get! Nevertheless, a fun and addictive game. Watch YouTube videos of this game by: Metr81, ZEUSDAZ. Amy has to collect 462 jewels scattered throughout her warehouse in order to prepare for the arrival of the Cyborg Queen. Each of the 42 levels contains ten jewels, and you must collect all of them within the time limit. If you manage to complete the level with more then ten seconds remaining on the clock, you will receive a bonus jewel. The concept of this platform game is very simple, but it's fun to play. The graphics are clear and detailed and there are a couple of merry little tunes to listen to on the main menu and while you play. The levels are very cleverly designed and the inclusion of a time limit adds to the challenge. See also: Chaos Rising, Concave, Ice Slider, Potato Rescue, A Prelude to Chaos. If you have ever wanted to know what it's like to run your own shop, this game may well interest you. You are the owner of a small toy shop in a little town, but you have greater ambitions. Customers will enter your shop and ask for an item, and you have to walk over to the display and fetch it for them. If you take too long doing this, or the item isn't available and you fob off the customer with excuses, he or she walks out and your reputation diminishes. At the end of each day, you must replenish your stock. Eventually, you should earn enough money to expand your business by moving to a better location and selling other items such as clothes, books, electrical equipment and computer games. This is actually a fairly entertaining game with colourful, cheerful graphics, although some people may find it rather easy and lacking any real challenge. You would think that with all the football management games that have been released for the CPC, that this one, released in 1992, would be excellent – but some people never learn. You're the new manager of Kettering FC, who finished third from bottom in the Conference league last season, and you're entrusted with restoring the team's fortunes. There are several things wrong with this game. 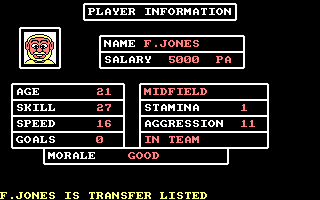 The transfer market system is stupid; the players magically become defenders, midfields or forwards depending on what vacancies you have in your team, and the game is far too hard – you're doing well if you score any goals in the entire season! There isn't even an option to save the game! This game definitely belongs in the relegation zone. President Halley's daughter Samantha has been kidnapped by Vulkhor, who wants to know the location of a secret weapon that will allow him to take over the universe. Oh my goodness! This is a job for Jim Power, the chief of President Halley's protection squad, who goes to Mutant Planet to rescue Samantha. The game is a fairly run-of-the-mill mixture of platform and shoot-'em-up action; jump across platforms, shoot enemies, and collect the bonuses they leave behind. The graphics look good, but the scrolling is very jerky indeed, and this also makes the gameplay frustrating, as Jim often won't jump when you want him to. The sound effects and music are also really bad. It is not often that one encounters games that make you want to throw your keyboard at the monitor in frustration, but this is one example. The concept is fairly novel – take a bog-standard platform game, but instead of controlling a person, you control a bat, and you must guide the bouncing ball to the end of the level and making sure it avoids the traps. There are also bricks to destroy, Breakout-style. The ball is incredibly hard to control, the game is too fast, and positioning your bat accurately is impossible. What's just as bad is that you only have one life – that's really helpful! Many years ago, the Bracelet of Turani was created to protect the land of Aquitania from the influence of the Green Witches. However, a witch called Jannedor has managed to break up the bracelet and its five charms, which are the real source of its magical powers. Now Aquitania is under a spell of bad luck, and you must recover the charms, in order to restore the bracelet's powers. This text adventure has a very quirky sense of humour indeed, especially when you examine the many objects that you can get! The difficulty level is set perfectly, and interestingly, you can't die – although if you solve some puzzles incorrectly, you will lose some luck and be unable to complete the game later on! This is another brilliant adventure from Magnetic Scrolls, although the graphics aren't quite of the same standard as their previous games.